Bring calm and quiet to your space with these relaxing feng shui chimes. Feng Shui means "wind and water," and these chimes negotiate the tension between the two elements beautifully, bringing calm and quiet style to any space. Handmade from ash wood, anodized aluminum, and various stones, the chime's understated design reflects its philosophical origins. Handmade in China. Click here to play sound. I really love the sounds of these chimes! The packaging-the careful way it was wrapped to prevent knotting and scrapping while boxed-the color choice sold me-very elegant and modern. The sound of the chimes are very relaxing-they tinkle-they sound like moving water. I'm getting one for my house! You wouldn't want to put this outside in strong winds. It seems very delicate. 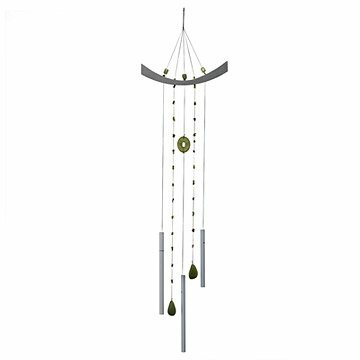 I was a smidge concerned about choosing something which had sound and motion that was for someone else but on the Uncommmon site they had a video of this pretty windchime with sound and the sound was so pretty and subtle I decided to take a chance. I am so thrilled to report the actual sound is exactly like that of the video...soft and sweet. My daughter and her husband love it and hung it right outside their kitchen window. Very well put together. Beautiful sound. A lovely piece. Love the chimes! I sending one to my cousin today! The chimes and design are unique - calming and serene! Eager to bring the chimes out to my garden in the spring! Would recommend highly!